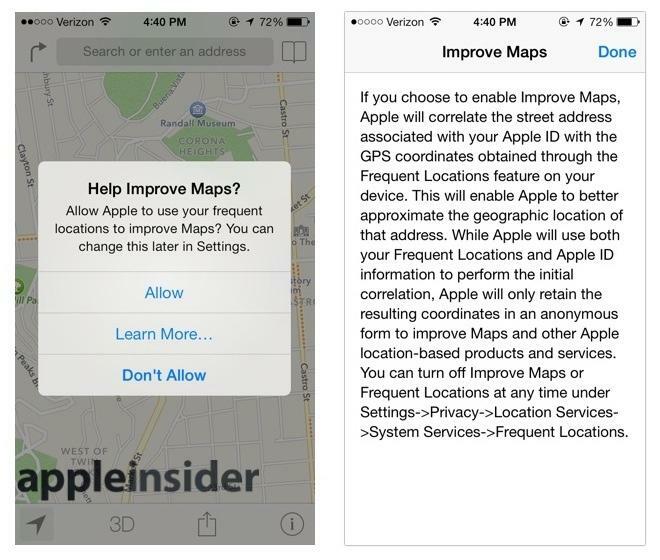 Part of the initial setup of iOS 7 includes an option to "Help Improve Maps," which as Apple explains, ties into Frequent Locations, a new feature of iOS 7. Frequent Locations remembers places you've been, similar to the the bookmarks history of your web browser, is are presented next to Maps Bookmarks and locations attached to Contacts (below left). Users who choose to activate both features will have their Frequent Locations linked to their iCloud / Apple ID account so the system can automatically calculate driving (or walking) directions to locations as users select them in Maps (below right, directions to Mavericks). Apple also benefits from anonymously storing coordinate information because it helps the company verify how accurate its driving time estimates are, by comparing them to the actual time it takes users to arrive. The release of OS X Mavericks, which brings Apple's Maps to the Mac, will also include new tools for facilitate end users reporting of errors. 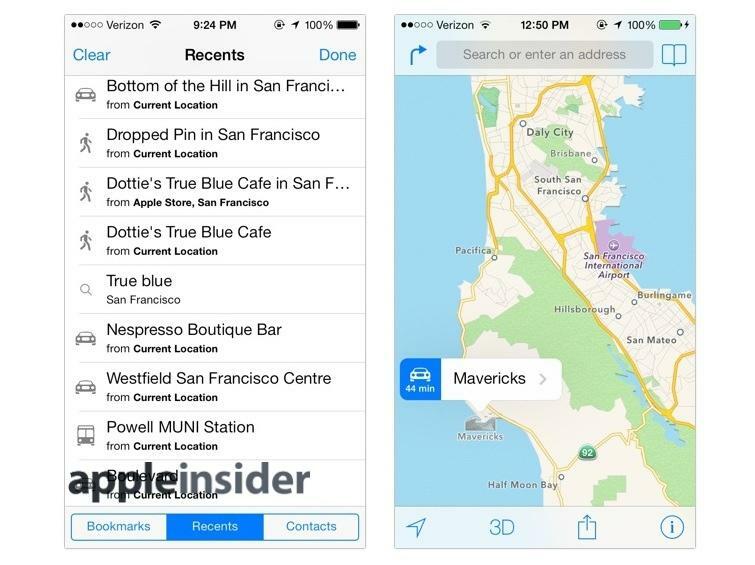 So far this year, Apple has also acquired indoor mapping service WiFiSLAM, crowdsourced mapping data startup Locationary and transit app HopStop, all apparently aimed at improving its mapping services. 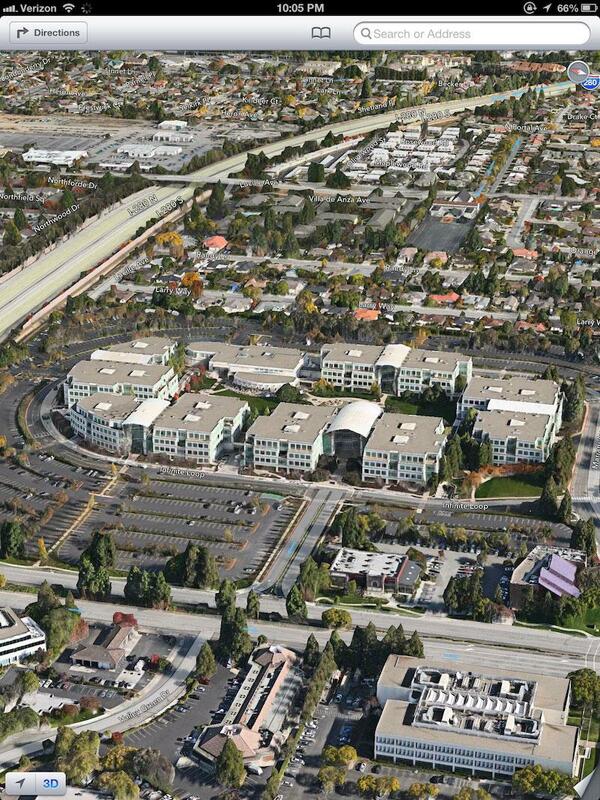 Apple's Jobs website currently returns dozens of open positions related to Maps. Among these are a series of Maps Ground Truth Local Experts, in listings that state that "the Maps team is looking for people with a passion for mapping, great testing skills, and deep regional knowledge to help us build better and better maps. "In this position, you will be responsible for the quality assessment of Apple Maps for your region, including both data and map services. You will monitor changes to our maps, provide feedback on unique local map requirements, collect ground truth information, and evaluate competing products." Apple currently lists openings for ground truth local experts in Washington D.C., Chicago, New York City and Los Angeles in the U.S., as well as European positions in Amsterdam, Berlin, Dublin, Istanbul, Madrid, Milan, Moscow, Paris, Prague, Rome, Stockholm, the U.K. and Eastern Europe, Middle East and Africa, Brazil, Canada, Mexico, India, Australia and Southeast Asia, China, and specific Asian cities that include Beijing, Hong Kong, Sapporo, Seoul, Singapore, Taipei, Tokyo and Osaka. Maps Bug Triage Engineer: "Maps problems are challenging to triage and debug. When a business is in the wrong location on the map, the issue could be anything from the address being wrong in our data to the conversion of the address to a latitude and longitude not working properly. We're looking for engineers to help triage internal problem reports, reproduce problems, and help us learn how to diagnose and triage problems better"
Maps Services QA Manager: "To test Maps well, we need to understand how the world is reflected in code and data, and also how to build great QA systems. Some tests can only be done manually, while other areas can only be covered adequately through large-scale automation." Maps Process QA Engineer: "Maps is an interconnected series of services that each have their own teams working to create the best user experience possible. It can be challenging to understand all the working pieces let alone understand their QA needs. Were looking for individuals who can help bridge the gap and document the unique QA requirements needed for each service." Maps Process QA Analyst: "In this role you'll work directly with Process QA Engineers and you'll learn something about how every part of Maps works. Youll be testing and documenting the QA processes involved in qualifying every component. " "Artificial Intelligence, Machine Learning, Large Scale Data Mining, Network Analysis, Information Retrieval, Probabilistic Modeling. These skills are required for developing models for identifying patterns and anomalies and for mining structured, semi-structured and unstructured data." Maps Senior Data Scientist: "The Maps Data Insights team has an opening for a craftsman skilled in Large Scale Data Mining and Machine Learning for making significant contributions in improving Apple Maps, involving the following techniques: Artificial Intelligence, Machine Learning, Large Scale Data Mining, Network Analysis, Information Retrieval, Probabilistic Modeling. These skills are required for developing models for identifying patterns and anomalies and for mining structured, semi-structured and unstructured data." Software Engineer - Maps Navigation: "The Maps team is looking for a proactive and motivated software engineer to focus on Apple's turn-by-turn navigation experience." Maps Web Applications Engineer: "If you are motivated by building applications that will be used by millions of people and have a penchant for visual details, this is an opportunity to build web applications that will help engage the community and internal teams to visualize maps data and to solicit input to improve the maps quality." iOS Software Engineers - Maps (multiple positions): As an engineer on the Maps team, your responsibilities will be working with advanced dynamic label layout of road labels, points of interest and other labels on the map; rendering of 3D flyover models, mesh generation of terrain, road rendering; implementing real-time rendering techniques, creating new and innovative features, solving challenging algorithmic problems and fixing problems. You will be working both on the client and the server to create a state of the art map." "The MapKit team is looking for a proactive and hardworking software engineer to join our team. We are looking for an engineer that's skilled with algorithms related to mapping. Familiarity with different spatial algorithms and data structures, such as R Trees, Quad Trees, BSP Trees are a big plus." Maps Software Engineer - Hadoop: "The Maps Data Insights team is chartered to look at various data signals, derive insights regarding map quality, and use those insights to drive improvements in Maps. Combining disparate signals such as community feedback and probe data to validate our maps is an opportunity that combines large scale data processing, analytics and visualization." Maps POI- Big Data Engineer: "Use Big Data technologies to extract data from existing NoSQL systems into system that can generate reports needed by business. Create unique ways to visualize and move our data." Maps Raster Data Domain Expert: "You'll be guiding maps and LBS quality measurement, visualization, and analysis to derive actionable insights through raster analysis, classification, and feature extraction. You will approach map data and location-based service (LBS) quality metrics with the creativity and inquisitiveness of a scientist —identifying and incorporating various geospatial, big data, and other resources. You will collaborate with excellent developers, system architects, regional experts, project managers, and other domain experts." Maps Traffic Accuracy Domain Expert: "The Maps Community and Data Insights team is chartered to analyze various data signals, generate insights, and leverage them to improve Apple Maps. In this role, you'll be guiding maps and LBS quality measurement, visualization, and analysis to derive actionable insights on traffic data quality."